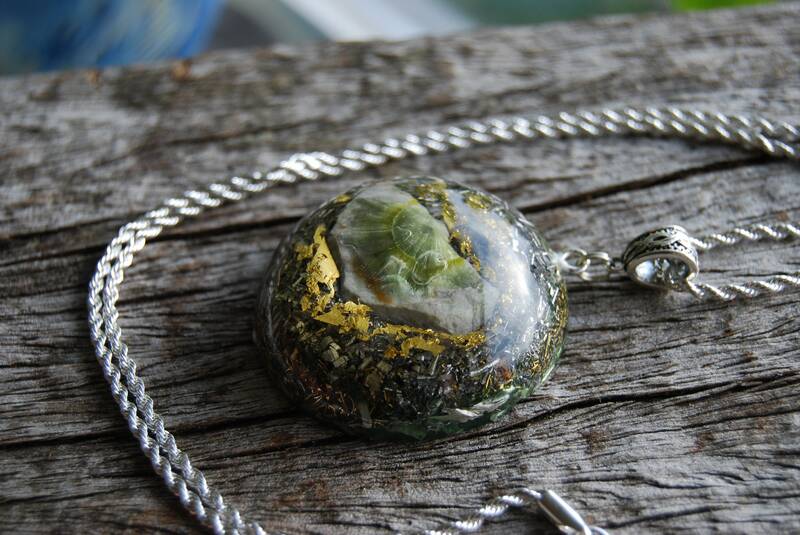 This large 4.9 cm / 1.9" in diameter Orgonite® pendant is made out of lots of brass, aluminium, bronze and copper shavings and 24K leaf Gold. According to Wilhelm Reich's research lots of metal shavings are neccessary to remove stagnant energy. The larger the pendant, the bigger the range. 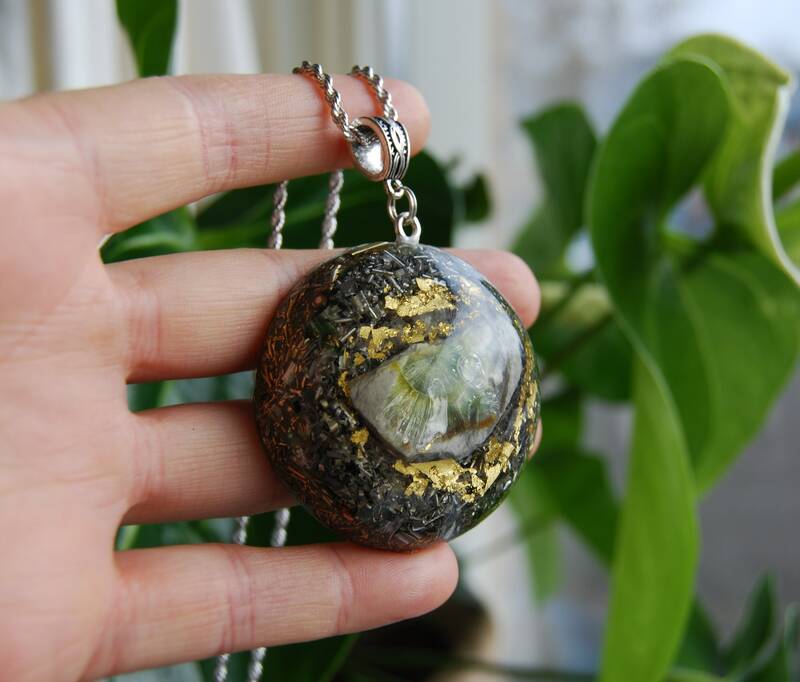 The main stone is a piece of Wavellite (main stone - front) Furthermore it consists of Rose quartz (self love), Pyrite (to enhance and deflect extremely low frequencies), black Tourmaline (to protect and ground excess energy), Rhodizite (to amplify) and clear quartz (for piezo-electric effect) all within a durable resin setting. 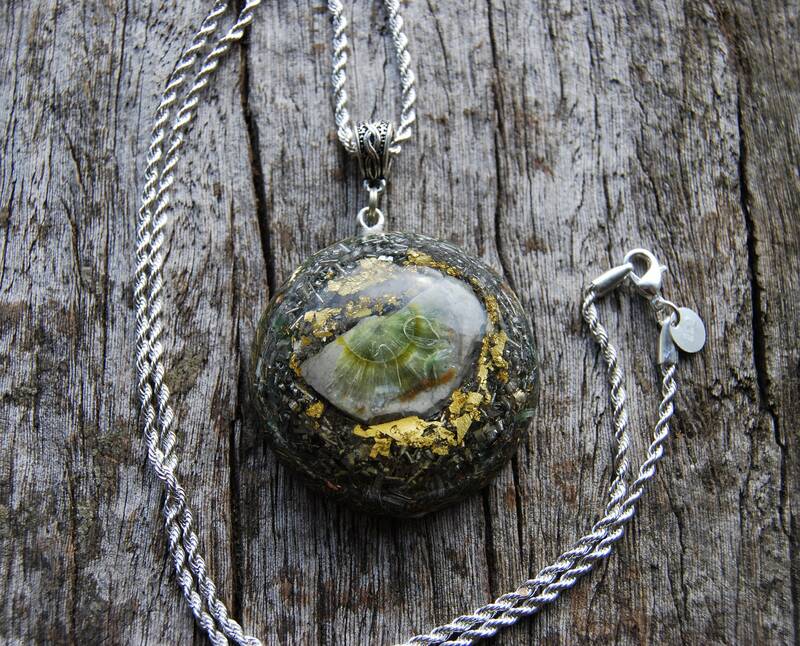 Wavellite is an unusual and rare gemstone that emits powerful vibrational healing energies. It will help you recognize and understand the law of one, that each and every person is whole and complete. It will help you acknowledge that everyone is one and the same and came from the same source. Wavellite will assist you in looking at the big picture first before deciding on anything important. It will also help you manage difficult situations so you can gain a better understanding of the reasons behind these challenges and struggles. Wavellite is often used in magic and crystal healing to promote the smooth flow of energy and to enhance the decision making process. Though there are a handful of crystals valued for their ability to improve the decision making process, wavellite is believed to be the only one among them to work at the “root level.” This means that, instead of just helping you to think logically, it should assist you in journeying deep inside of yourself in order to become familiar with your uniqueness. It may additionally allow you to see and examine the larger picture and reveal to you a range of paths open to you. One might seek out this mineral if uncertain about a career, relationship or other major life change. The best way to make use of wavellite's decision making enhancement qualities is to meditate with it during a full moon. 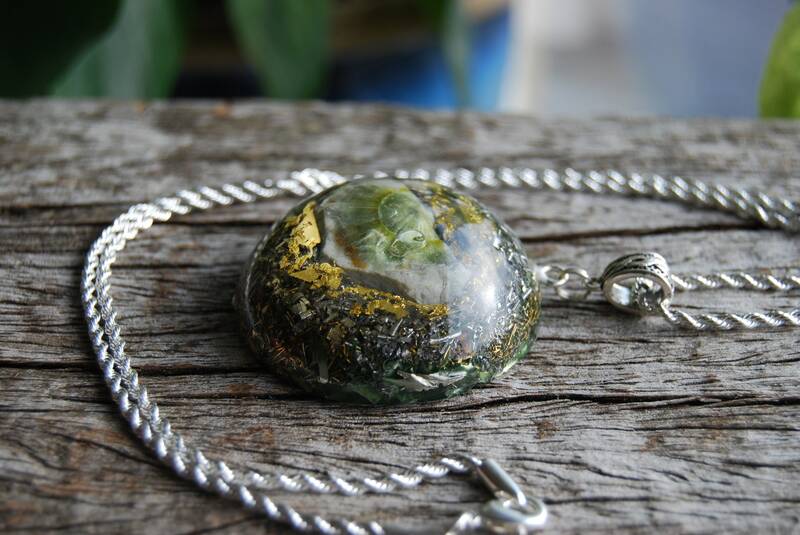 When worn in the form of jewelery, meditated with and/or simply kept on one's person, wavellite is also said to calm anger and gently bring issues suppressed deep within the psyche to the surface so that much needed healing of the soul may then occur. This makes is a particularly valuable mineral for those who have suffered abuse and trauma in childhood and are seeking peace in adulthood. Another thing that this mineral is said to do is help its keeper to recognize the “law of one,” or that we are part of something complete and whole. That is to say, we are all from the same source and one and the same. 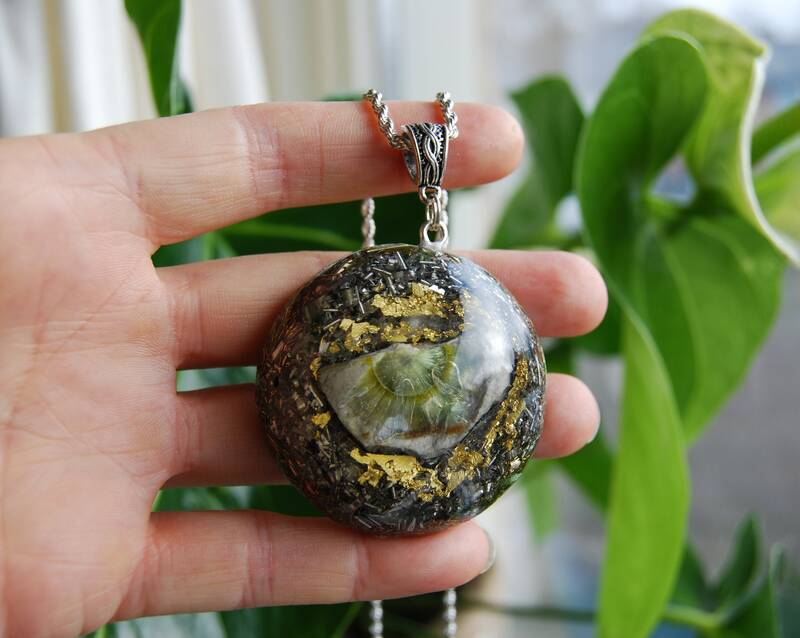 Wavellite resonates with the solar plexus and heart chakras and is associated with the zodiac sign of aquarius, the element of air, and the energies of love, luck, healing and abundance. Its vibration number is 1. In the realm of physical healing, wavellite also serves many useful purposes. Specifically, crystal healers have used it to treat dermatitis, increase blood flow and stabilize blood counts (red versus white blood cells), and clear “cellular memory” that may have otherwise induced disease states. In general, wavellite is regarded as a great “balancer of energy flow,” performing as a regulator for peak physical health. All healing benefits (and simple beauty and rareness) considered, wavellite's desirability in the crystal trade is not surprising. It is an uncommon mineral that would make a very valuable addition to anyone's collection. It comes on a 925 sterling silver plated 22" / 58 cm necklace.